We looked at the top 1 Canon DSLR Cameras and dug through the reviews from 7 of the most popular review sites including New York Times Wirecutter, DP Review, Tom's Guide, Digital Trends, Tech Radar, Shutterbug, Digital Camera World and more. Through this analysis, we've determined the best Canon DSLR Camera you should buy. In our analysis of 58 expert reviews, the Canon Canon EOS 6D Mark II DSLR placed 6th when we looked at the top 10 products in the category. For the full ranking, see below. It produces great-looking images, even when shooting in dim lighting, has Canon’s Dual Pixel AF for smooth and accurate autofocus when shooting video, and has the same great autofocus system as the EOS 80D when shooting stills. Updated 26MP sensor with good high ISO performance. Faster-than-average Live View and movie AF. The AF system is versatile and responsive, with 45-point all cross-type AF sensors and five area selection modes, so you can match and track with your AF options for virtually any subject or scene. Fast Dual Pixel live view AF, Great vari-angle rear touchscreen, Handling, build and controls. Less low ISO dynamic range than even crop-sensor competitors. Does not support EF-S lenses. 2 fps bursts with continuous AF in live view. The poor dynamic range is disappointing, and while the boost in AF performance is definitely welcome, coverage is too heavily weighted to the centre. No 4K video, Image quality hasn't moved on, Only one card slot. It’s hard to go a full day, or even an hour, without scrolling across a stunning image of a landscape or picturesque foreign town. Instagram has brought these incredible views right to your fingertips. These snaps make you stop and stare, and the very best transport you around the world in an instant. And naturally, they have the power to inspire you to venture out and try your hand at photographing your own world and travels. DSLR cameras come in a full spectrum of prices and features and are the preeminent image-capturing technology available today. They boast the highest image quality, speed and user-friendly design to match basically any type of photography you can dream up. They are generally the first step toward serious photography for many people. It’s an investment, so it’s important to understand the DSLR cameras available and what will best fit your personal needs. Canon DSLRs make up a slice of the wide array of digital cameras available on the market today. There are models suitable for beginners, professional photographers and everyone in between. DSLRs are the leading camera technology available today, and Canon is one of the most popular manufacturers. Unlike basic digital cameras, when buying a DSLR camera, you’ll likely purchase at least two parts. They are made up of two main components, the body and the lens. Generally, these pieces are sold separately, and there are specific lens options for each camera body. The DSLR camera body contains a mirror that reflects the light onto an optical viewfinder that displays the image viewed through the lens. It is with various lenses, not camera bodies, that you will notice the biggest difference in photos and capabilities. As such, one of the most important characteristics to think about is the system of lenses compatible with each camera body. While you may begin with one or two lenses, over time, you will likely invest in more as your photography grows. Each camera body connects with a different system of lenses. For beginners, there are specific entry-level Canon DSLR models made just for you. 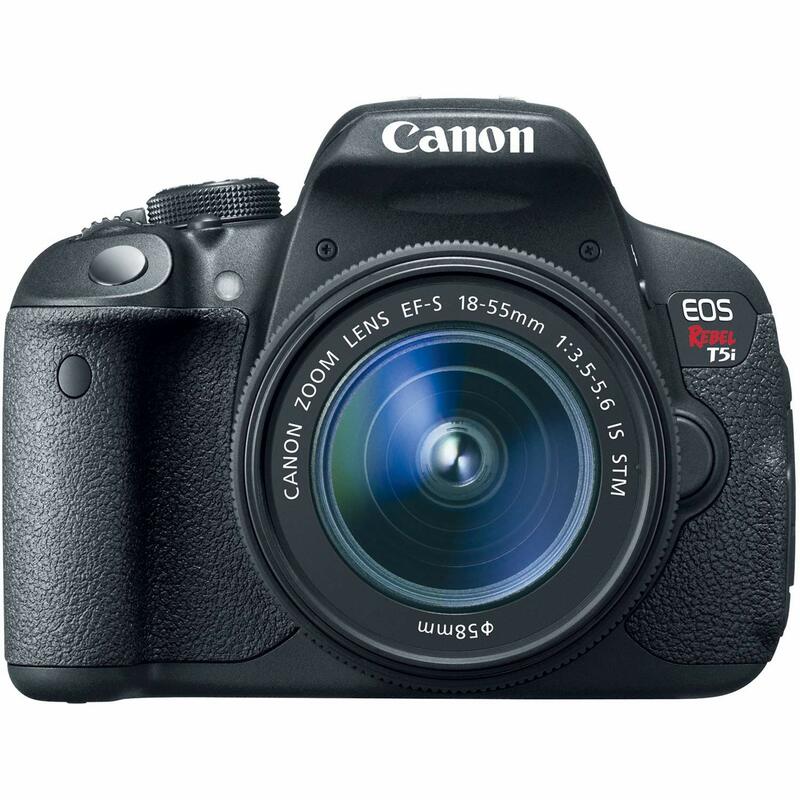 These cameras, like the Canon EOS Rebel T6 Digital SLR Camera Kit, are a good starting point because of their economical price point (around $300) and ease of use. The imaging quality of these cameras is still high, but the amount of control you have as a photographer over the camera’s settings is more limited. There are automated options and a variety of preset effects to rely on while learning how to handle a DSLR camera. If you’re familiar with photography and want a bit more control and range in a Canon DSLR, you may be ready for the intermediate category of cameras. This category includes the greatest number of DSLRs and fills the space between beginner and professional levels. It’s an exciting category because much of the innovation occurs in this space. For example, the Canon EOS 70D DSLR features redefined autofocus technology along with an enhanced feature set, upgrades to its predecessor. With the enhanced capabilities also comes a higher price tag. Similarly, the newer Canon EOS 80D DSLR offers even more upgraded features. It boasts excellent auto-focus in live view, as well as video mode and faster shutter speed for capturing every moment and movement. The camera body also includes weather sealing to protect against the elements. These are valuable features, but it may be hard for less experienced shutterbugs to justify the added cost. The top pick, the Canon EOS 5D Mark IV DSLR, also falls within the intermediate category, albeit on the higher end. It has top-of-the-line professional features and innovative technology that contribute to its high-end price tag of around $3,000, yet a user-friendly and compatible design make it approachable. Notable features like 4K video capture, an upgraded auto-focus system, a touchscreen and high-quality 30.4 megapixels add to its appeal for aspiring shutterbugs and professionals alike. Within Canon’s range of DSLRs, there’s a camera and a price point that’s perfect for every photography ability. Technology is constantly changing, offering more features at ever more reasonable prices. Digital cameras are a thoroughly modern invention. It wasn’t until 1975 that Steve Sasson at Eastman Kodak built the first working, but low-quality digital camera. Technology has progressed in leaps and bounds since that initial 8-pound .01 megapixel camera. Canon introduced the EOS cameras back in 1987. In November 2001, Canon introduced its first professional digital SLR camera, the EOS-1D. It was ahead of its time with 4.1 megapixels and an APS-H CCD sensor, as well as an X-sync speed of 1/500 and a maximum shutter speed of 1/16000. No camera since has replicated these exact capabilities. Less than a year later, Canon releases its first full-frame camera, the EOS-1Ds. And in 2003, the company launched the first of its consumer DSLR models. The most recent development is the addition of 4K video recording capability to DSLRs. Today’s DSLR cameras can capture images with as many as 45.7 megapixels. The future of photography looks very bright. Entry-level DSLR cameras generally incorporate a APS-C-sized sensor and polycarbonate construction. These two components help make them compact and lightweight. Some entry-level DSLR cameras also offer guide modes to help teach new photographers about the controls and settings with the ultimate goal of understanding exactly how to produce specific types of imagery in mind. DSLR camera tend to have superb battery life because the optical viewfinder uses minimal power. Depending on the length of time you’re shooting, DSLR cameras can take thousands of photos on a single battery charge. That makes traveling with a Canon DSLR very convenient. DSLR cameras can range from around $200 on the low end to $1,000 and up for the high-end cameras professionals rely on. Be careful when changing lenses not to touch the mirror or sensor or get dust on the inner components. If anything does get on the sensor, some cameras include an auto-clean mode or you can use specialty cloths to clean.